A New Doping Scandal Targets Russian Use of “UV-Doping”. A shocking report published today reveals the details of another allegation of an official doping program in Russia. The report, made by the research institute “Independent Doping Inhibition Organization Technologies” (IDIOT), uncover a common and semi-official use of UV-exposure with the purpose of increasing the overall performance of Russian athletes. An IDIOT representative claims the his organization got suspicious after the surprisingly stellar performance by Russian athletes in the Sochi Olympic games 2014. “We noticed that the participants from Russia had a much darker skin-color that normally should have been the case at that time of the year”, states the representative, who would like to remain anonymous during this early stage of the process. The report also stresses the well-known historical fact that UV-radiation was widely used in the Soviet Union, not only to increase the performance of athletics but also to keep the general population healthy and in good shape. Under the influence from western advisers after the end of the cold war, the use of “UV-doping” appeared to have stopped with a general decline of both athletes' results and people’s health as a result. But the Russian successes in the Sochi Olympics made it clear that this type of ancient stimuli, which so far doesn’t fall under any performance enhancing restrictions, has been re-introduced by the Russian trainers. The IDIOT-report describes the problem to identify and measure UV-doping but propose to use the blood-levels of vitamin D as the indicator. “We know that this is not perfect, since UV-exposure gives so many other performance improvements than just from vitamin D”, admits one of the authors of the report. “But it is an indicator of UV-doping, it is easy to measure”. “We propose that from now on, all athletes who have levels of vitamin D higher than the lowest level (20 ng/ml) recommended by National Institute of Standards and Technology (NIST), will be banned from participation in any international sport events. As with all the other recent introduction of new rules for doping, the Russian powers consider this to be a political attack which has nothing to do with sport. “Just because people in the west have become so afraid of exposing themselves towards UV-light, they are now trying to bring also us down to their levels”, explodes the head of Russian Institute of Sport Clinical Studies (RISCS), Professor Sontsev Zagar. “It is not only our athletic performance they want to degrade but also our ability to defend our country. It’s a part of a hybrid war against Russia”, claims a spokesperson for the Russian Ministry of Defense. That UV-exposure makes athletes faster, quicker and stronger is well documented by Dr. John Cannell, the founder and executive director of the Vitamin D Council in his book. It is not only thanks to vitamin D from exposure to UVB-rays but also thanks to the Nitric Oxide from UVA and probably many other, not yet identified, processes in our bodies. If the Russians also have taken advantage of the new technology which combines UV-light and Red light it can even better explain their re-emergence on the top of the prize-pedestals. The Red light strengthens the collagen under the skin and makes the recovery after training much faster. Lamps with this Collatan-mixture also emits a very strong white light which increase testosterone. 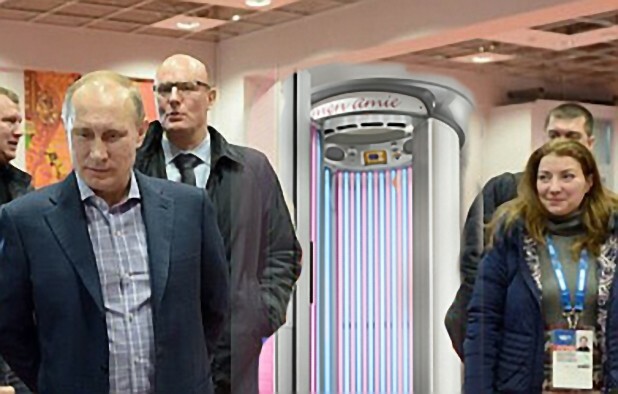 The picture below, shows that Russia really used a sunbed with both UV- and Red Light lamps in their camp during the games in Sochi. The classification of UV-exposure as doping is, however, just as crazy as its classification as a carcinogen. If the news is true, Mr. Putin must be ashamed of what is happening in his country. Omg this article is very very informative.But my question why it is banned as it is natural . Well, Russia will remain a closed country while Putin or its friends will be the leaders of the country. Beside this, Putin wants to revive the old U.S.S.R. so, what do you expect to see from there? Be sure that UV-exposure is only one way of making an athlete faster, if this will be exposed be sure that they will find another trick to improve the performance of their athletes. Being a former Communist country, they only want medals and titles, because a dictator always wants to prove its people that he is the best leader in the world. Honestly, I don’t see why sun exposure would help increase your performance. From my point of view, the best way is to train your body to its fullest. Anyway, I am not an expert when it comes to the matter, but I sure would like to try it and see the results for myself.